Enjoy our brand new oceanfront deck area, just completed late 2014. Escape to this peaceful 2 bedroom retreat and let the sounds of crashing waves lull you to sleep. Kick off your shoes Hawaiian style and enjoy this perfect private setting on a bluff overlooking the romantic Pacific Ocean. Relax on the spacious lanai or take a dip in the pool which juts out over the ocean where turtles, dolphins and whales (in season) frolic. A minutes walk to Poipu Beach or Shipwreck Beach, this convenient, centrally located condo offers the perfect vacation getaway. Dine at one of the many nearby restaurants or stay in and create your own special meal in the well-equipped kitchen, complete with gourmet appliances and cookware. Relax to the sounds of tropical birds as you take in the romantic views of the azure Pacific from throughout your island home. Poipu Palms is that exceptional dream destination. Easy access gives you no more than 2 steps to carry your luggage in or purchases from the local island market. Let the trade winds keep you comfortable and in that peaceful island frame of mind. Restful sleep awaits you in the master California king bed with 2 fully renovated, tastefully decorated sleeping quarters and features an over sized lanai. Free wireless internet. Area restaurants and entertainment are simply a short drive and even walkable in some cases, such as the 5-Star Grand Hyatt Resort and Spa. Whatever your specific dream, you'll find it here at Poipu Palms #101. Pack your bags. Your peaceful island retreat awaits! As travellers, the trip from New York city to Kauai is a real treat. The busy life on the mainland is comfortably contrasted by the island life. That's what we're all about. The island of Kauai is where living feels tropical, and natural with an easy pace. The trade winds, tropical birds and crashing waves provide the backdrop to our private destination. We love relaxing by the pool that feels like part of the ocean where we watch the sea turtles feed on the rocks below. And with a small 12 unit building it's never crowded. As active beachgoers we love walking down to Poipu Beach and either find ourselves swimming, boogie boarding or reading a book with our feet in the sand...with Brennecke's to provide a great Burger or cocktail. Some evenings we like the beautiful seaside walk to the Grand Hyatt for happy hour drinks and Pupus at the Stevenson library or dinner at Tide Pools. Or sometimes we just stay in, cook at home and enjoy passing time by candlelight out on the lanai. Quiet with a beautiful view. Great place to stay. Clean, quiet and convenient to the beach and shopping. Everything was comfortable and well taken care of. The pool, while small was great for our grandson. Loved seeing the turtles and whales in the ocean. Very comfortable and great ocean views! The property and the location of the pool and deck has the best views! Absolutely amazing!! The condo was wonderfully appointed. The only negative on the condo is it wasn’t very clean—our feet would turn black from walking on the floor. A couple of days later when I mentioned it to Parrish, they became angry and defensive and asked why I hadn’t told this when we first checked in. I replied, “I thought you might be coming back to clean it and I realized they weren’t coming back. I want to be clear this isn’t a reflection of the condo or property—but Parrish the property managers. They charge the highest rate on island as rental property management. I know because I had a property there I was going to rent and I considered Parrish to be the Property managers. I’m really glad I didn’t go that route with them. As owners we have recently completed a multiple thousands of dollars facelift to the condo, it is important to us to improve and enhance our guest experience from start to finish. I always appreciate hearing our guests feedback and wish I was part of this situation while things were happening so that I may have become involved to assist… As it turns out, my vacation rental manager the Parrish Collection Kauai responded same day to the guest complaint and updated the super clean status of all floor sufaces. This prompt attention is what we’ve come to expect from Parrish. We have been managed by the Parrish Collection for over 10 years and have found their care and concern for our guests and their attention to our condo to go far above and beyond. We pride ourselves In doing all we can to make our guests experience the best it can be while they are enjoying our Kauai home. Many who find their way back to us time and time again. Just the perfect vacation in an uncrowded month! Walk downhill to Po'ipu Beach and snorkel each morning. Then back by Brenneke's Beach to visit the turtles on the way back. 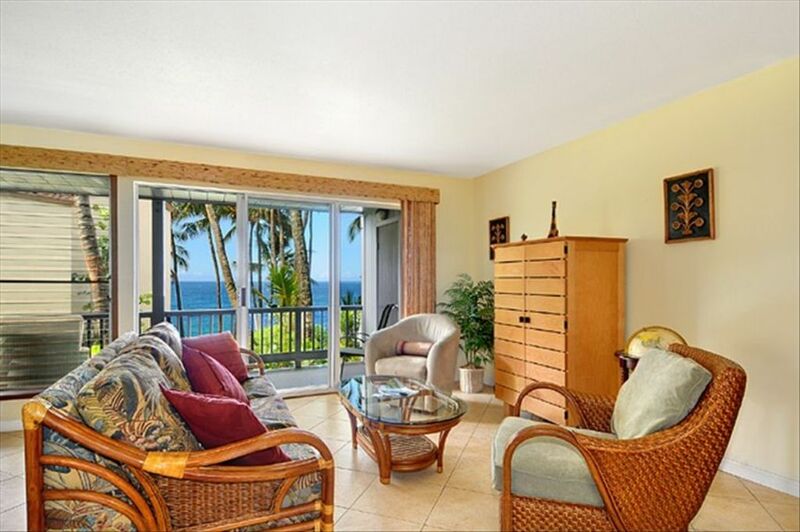 Take in the ocean views while dining on the lanai, and use the well equipped kitchen to prepare meals. Ideal!! Get drinks and small plates at the Honu Bar in front of Marriotts, just past Po'ipu beach right on the beach. Fun and delicious. Absolutely loved our stay at this property. Right on the ocean. The property itself is ~12 units. While we were there we felt like we had the property to ourselves. The unit has updated appliances and is well appointed, the views are amazing and this is a great basecamp for all of the adventures that Kauai affords. From the pool, you can watch turtles feed while the waves crash against the cliff. There are several beaches within walking distance, or a very short drive. There are a few things to be aware of but please note the title of my review, I would certainly book this property again if visiting the island, I just think it is important to be aware when booking. The mattress in the master bedroom is like a wet sponge and in my opinion needs to be replaced. There is no A/C but this appears to be standard with most of the rentals on the island, that being said, if the sea breeze is not blowing, it can tend to get very hot and humid, there are ceiling fans and other fans that can be utilized to help with the situation. The unit is on the first floor right off of the parking lot, but noise was not an issue for us. Make sure you bring an eye mask for sleeping because you will want all the shutters/windows open in the evening to keep the temperature under control as it is well lit in the master bedroom. I did bring an eye mask and this helped immensely. One last point, while enjoying the pool, there were "locals" that crept in. I know this because I spoke to a few of them, and there is no real barrier preventing this. They were not obnoxious, but it is worth noting. Collectively, this was a great unit, great location and good value. Thanks Poipu Palms and The Parrish Collection for a fantastic vacation to this INCREDIBLE island. Aloha...A new mattress has been placed in the master bedroom...We strive in keeping out guests happy and the unit in pristine and welcoming condition. The views and everything else remain beautiful...We welcome our future guests! This condo was perfect for 2 couples. We really enjoyed the space, the location on the island, and the views from the pool deck cannot be beat! Loved watching the sea turtles everyday. Would definitely stay here again. My family of 4 enjoyed 5 nights at Rod's wonderful place. Rod and his management team were wonderful to work with from researching the place to check out. The lanai was a perfect place to sit and listen to the water, enjoy the palm trees swaying in the wind and look out at the vast Pacific. The common sitting area and pool were wonderful for sunset viewing as well as turtle viewing. The condo has everything you would need -- cooler, chairs, boogie boards, towels, stocked kitchen, games, towels, washer/dryer, great soaps etc. The location is amazing with a short, pleasant walk mostly along the waters edge to either Shipwreck's Beach (solid boogie boarding beach) and Brennecke's (another solid boogie boarding beach) and Poipu (wonderful swimming beach for kids or adults who don't want to wrestle with the waves). My 17 year old son said that Poipu was his favorite place we've ever been to as a family. While we haven't traveled the world, we've been to some amazing places. The value for this place is outstanding and it was a wonderful place to rest our head after a fun day in the surf.